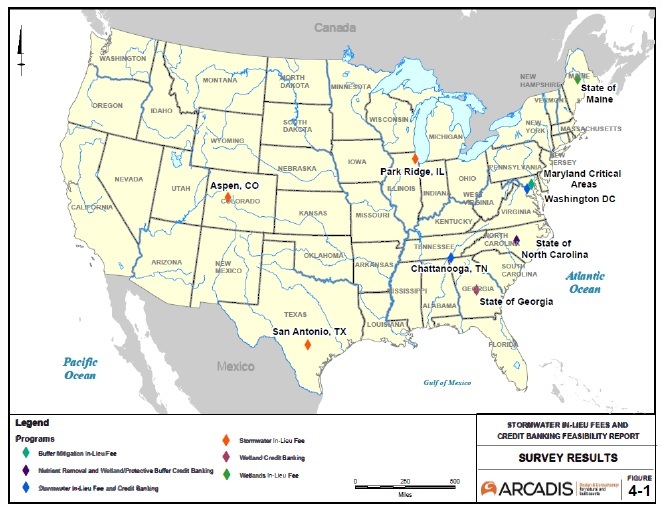 The federal Clean Water Act provides for funding to states for regional water quality management planning activities. 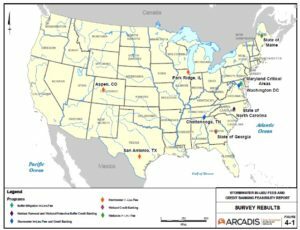 The Environmental Protection Agency (EPA) awards 604(b) grants to states, which in turn make awards to regional planning and interstate organizations. Under this program CDRPC provides technical assistance to county water quality coordinating committees and MS4 communities. 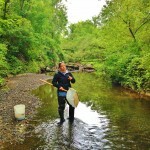 CDRPC, coordinates water quality outreach with the NYS DEC, and creates and participates in watershed planning activities. Aging and failing water infrastructure is increasingly putting the safety, reliability and affordability of our water at risk. Infrastructure failures such as water main breaks, sink holes, sewer collapses and pump failures are all too common a regular occurrence in many communities. Emergency repairs are expensive and disruptive. Permitted Combined sewer overlfows contribute billions of gallons of raw sewage entering our water bodies every year. Wastewater treatment plants struggle to keep up with demand, implementing the latest technologies, and reaming cost-effective. Water and sewer fee hikes, a regressive tax, are mostly felt by poor or those on a fixed income. The advocacy organization Environmental Advocates estimates that to fix our crumbling drinking water and wastewater infrastructure, it was estimated in 2008 that New York must invest close to $80 billion over the next 20 years. 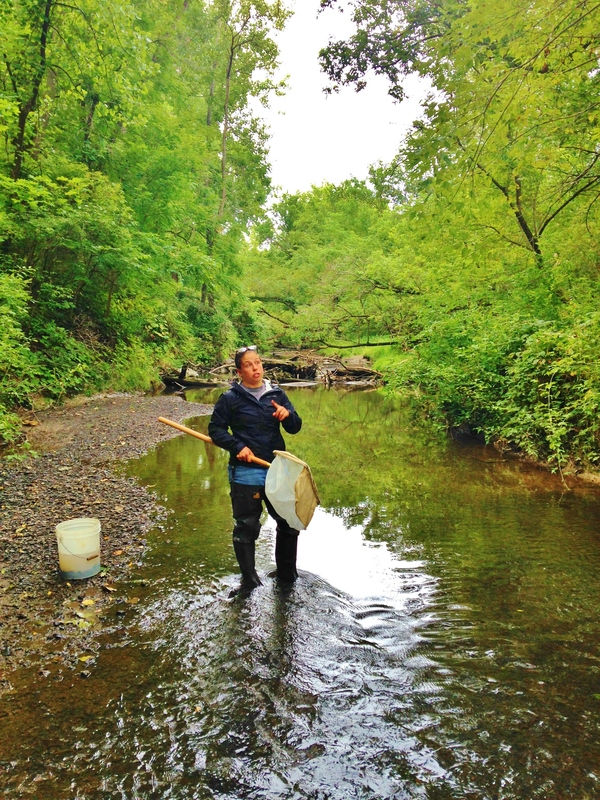 While the needs outpace the funding by a wide margin, thankfully there are grant and loan programs available by the Federal Government and New York that communities may tap into in effort to address the capital backlog and protect water quality. Find a comprehensive list of these program here. Six Capital District communities (the APCs), working collectively, with support from the Albany and Rensselaer County Sewer Districts, developed a joint Long Term Control Plan (LTCP) that will, through the implementation of more than 53 projects and programs, significantly abate Combined Sewer Overflow discharges in the Hudson River and demonstrably achieve water quality. 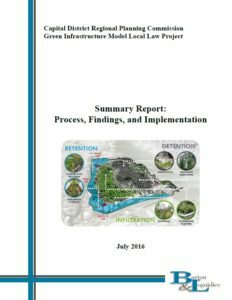 The LTCP, jointly funded and implemented by the six APCs includes several innovative Green Infrastructure (GI) strategies and reports. The Toolkit emphasizes stormwater management through retention an infiltration with a focus on urban areas and small sites – specifically focusing on volume as its main objective rather than water quality because the manual is aimed to communities with combined sewers; overflows and bacterial contamination. Check it out here. 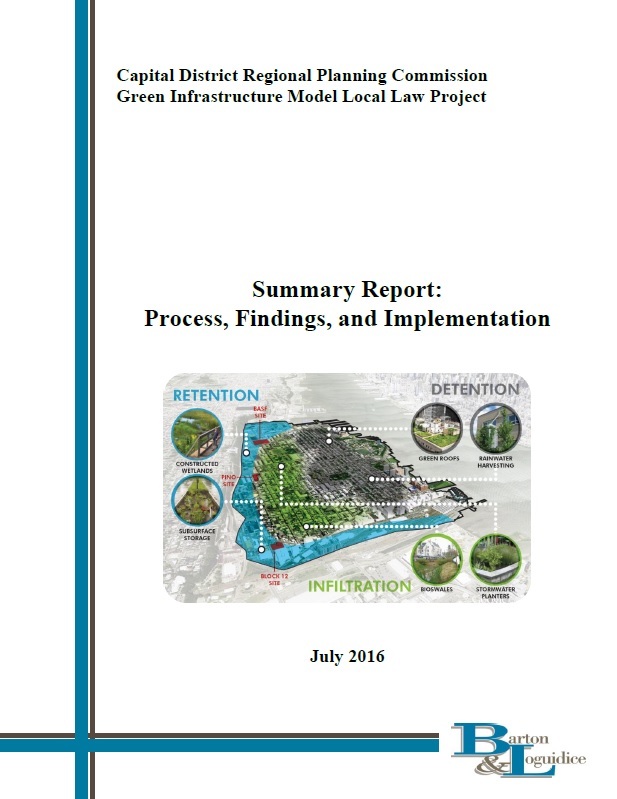 During the creation of our GI Code Audit, we encountered the need for a reference page of resources for questions that may be frequently asked, or further explanations of green infrastructure practices and ideas. 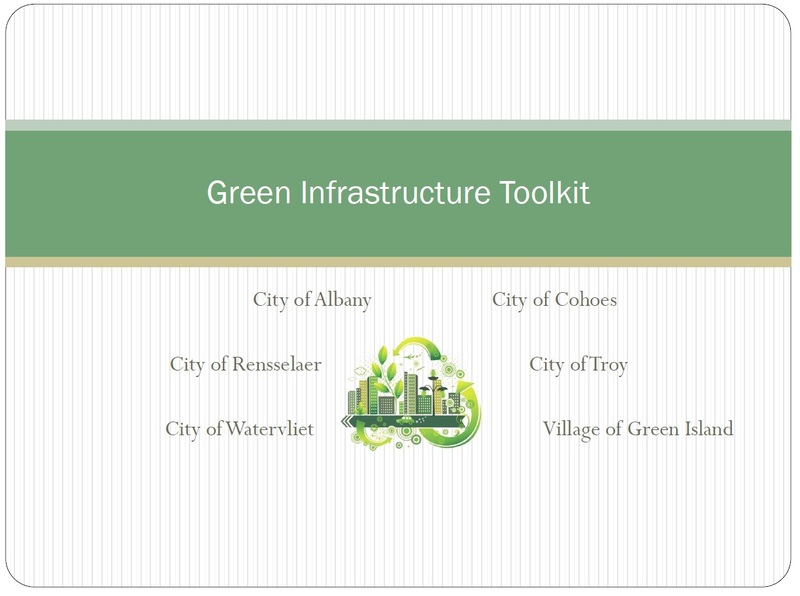 Click here to view this page of helpful resources regarding green infrastructure. The Stormwater In-lieu Fee, Credit Banking and Trading Feasibility Report was been prepared for the APCs to assess the feasibility of establishing a Stormwater In-lieu Fee (“ILF”), Credit Banking and Trading Program for the APCs. A stormwater ILF program is an innovative alternative to traditional stormwater management funding whereby a municipality or government agency establishes a stormwater retention or detention requirement for development or redevelopment projects and allows the property owner or developer to pay a fee in lieu of meeting the stormwater runoff requirement onsite. A stormwater Credit Banking and Trading program is an innovative market-based approach to stormwater management funding whereby a municipality or government agency allows the property owner or developer to purchase stormwater credits to satisfy the retention or detention requirements or bank the credits such that they can be used by the same developer on another project. The credits are generated and provided by other property owners who have implemented stormwater runoff mitigation projects that have exceeded the requirements. These projects were made possible by grant support from the New York State Department of State Local Government Efficiency Program, The New York State DEC Estuary Program, and the NYSDEC 604b Grant Program. Capital District municipalities are investing millions in infrastructure to abate CSO discharges, protect water quality, prevent localized flooding and address capital needs in their systems. Aside from supporting your local public works or water department, what can you do at your home of business to help improve water quality? 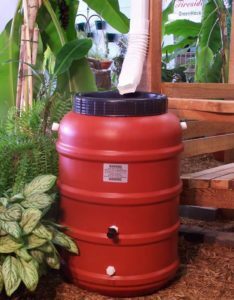 Rain barrels can provide homeowners with access to free rainwater for irrigation, gardens and washing vehicles. When installed under a downspout that would otherwise drain to an impervious surface or directly to a sewer line, the barrels can help reduce combined sewer overflows and improve water quality for receiving waters. Recognizing the benefits of rain barrels, the Albany County Soul and Water Conservation District sells rain barrels for $80. To purchase one click here. Below, find helpful resources on the benefits, installation and maintenance of rain barrels. Check out this handy guide on disconnecting a downspout. Use kitty litter to clean up spills. Use a commercial car wash or wash your car on a lawn or other unpaved surface. Never hose down repair areas to storm drains. Recycle fluids or ensure they are disposed of properly – NEVER anything down the storm drain. Use drip pans to capture fluids. Eliminate the use of chlorinated solvents which are toxic and hard to dispose of. Use detergents or water based cleaners. Fit storage tanks with spill and overflow containment. Pour wash water into the sink, never into a catch basin. Everything you apply to your lawn to make it look great has the potential to end up in a creek, stream or lake where it can impact water quality or lead to the proliferation of invasive species and toxic algae blooms. Phosphorous and Nitrogen rich fertilizers may yield the biggest tomatoes on your street, but if not applied property, fertilizers containing these ingredients can end up where they never belong – in nearby water bodies – and destroy the natural balance. Cover and contain top soil and mulch piles when not in use. Compost mulch and leaves instead of sending them to the dump. Ensure lawn waste is not left in the street where it can wash into storm drains. Avoid using lawn chemicals and fertilizers in areas where they could wash into streams or storm drains. Avoid applying lawn chemicals and fertilizer in windy conditions. Never use pesticides or fertilizers when rain is in the immediate forecast. Plant gardens of native drought and pest resistant plants to collect and filter rainwater, Native plants don’t need as much fertilizer to survive. The water used in these amenities can be hazardous to the environment. The same chlorine that helps keep your pool safe for swimming can kill essential bacteria in natural water courses. Never drain pools, fountains or hot tubs to a storm drain or nearby water body. If there is no suitable lawn area to discharge, call your municipality before emptying your pool into the sanitary system and drain the pool slowly using a low volume pump or siphon. Never drain in the rain! Never clean filters in a street or over a storm drain. Do not use copper-based agleasides. Control algae with substances like sodium bromide. Make sure water used to acid wash a pool or fountain is neutralized prior to discharge. Soda ash can be used to keep the pH between 6 and 7 before discharging. Clean paint brushes in the sink, not outdoors. Contact your local municipality find out dates and places to properly dispose of excess paints through a household hazardous waste collection program. Sweep up construction debris to prevent it from washing into a water body to a catch basin. Fill tanks over porous surfaces, away from sewers, storm drains or ditches. Have your septic system inspected one every three years. Inspect dumpsters regularly to ensure there are no leaks. Repair or replace damaged dumpsters. Encourage employees to sweep and keep areas clear of litter to prevent it from blowing down the street. Install grease traps and collect bulk grease for recycling. Don’t forget to ensure spill prevention is part of the storage system. 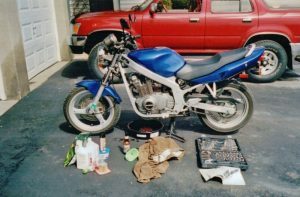 Never pour grease down the drain! Clean floor mats, filters, mops and garbage cans in a slop or janitorial sink. Not the parking lot, alley or the street. Have clean-up materials neat dumpsters, loading and delivery areas. Until Murphy learns to use the bathroom, he’s got to do his business outside. It’s a fact – no one enjoys scooping poop, but it’s your responsibility as a pet owner or caregiver to prevent pet waste from ending up in streams and lakes Pet waste is loaded with bacteria that can make people sick. When left on the ground, rainwater and melting snow can wash it into storm drains and waterways polluting streams, beaches, and drinking water. 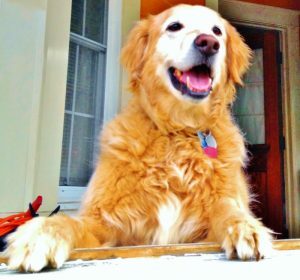 Properly dispose of pet waste by flushing it down the toilet or placing it in a sealed bag in the trash. Never put waste down the storm drains, in catch basins or in bodies of water. On the subject of dogs and water quality – NEVER let your dog come in contact with water you believe is contaminated with an algal bloom. Many types of blooms are FATAL to dogs. Learn to recognize these toxic blooms here. Rain gardens are excellent ways to beautify your property and manage stormwater at the same time. Below, find some handy resources to learn more about the benefits, construction and maintenance of rain gardens. Special thanks to the Stormwater Coalition of Albany County for the development of a many of materials we reference above.